Wands are associated with fire energy, and the Ace of Wands is the core representation of fire within the deck. 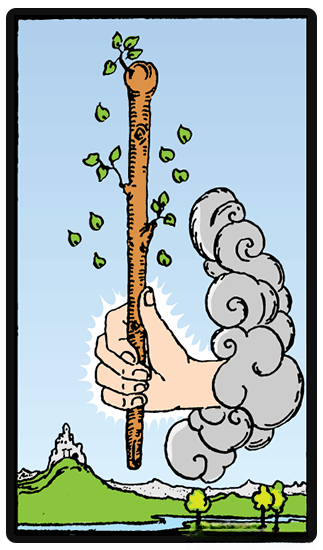 The card shows a hand that is sticking out of a cloud while holding the wand. When we look at this card, we can see that the hand is reaching out to offer the wand, which is still growing. Some of the leaves from the wand have sprouted, which is meant to represent spiritual and material balance and progress. In the distance is a castle that symbolizes opportunities available in the future. Wands symbolize creativity, and the Ace of Wands is the boldest among the cards in the suit. It is not the kind of creativity that you learn from school or as a hobby. It is bravely finding your own voice, it creates a place where you can develop your own vision. In other words, it is associated with willpower, and creativity in the cosmic sense. When you draw the Ace of Wands, it is an indicator that you should just go for it. Take the chance and pursue an idea that you have in mind. Take the first steps to start the creative project. The Ace of Wands calls out to you to follow your instincts. If you think that the project that you've been dreaming of is a good idea, and then just go ahead and do it. The Ace of Wands calls out to you to follow your instincts. If you think that the project that you've been dreaming of is a good idea, and then just go ahead and do it. The Ace of Wands can also perhaps mean that you are waiting for a sign to start a project. To draw this card pushes you to act now, instead of brooding over research and more planning. Take small steps today, and then continue to grow your ideas over time. Action is what helps you grow, and build momentum. Don't remain in the abstract. Another Ace of Wands meaning is the occurrence of a breakthrough moment in your life. It is a time when you are motivated and inspired about a passion project or idea. You are excited about the opportunities that are opening up for you in the near future. The reversed Ace of Wands indicates trials and tribulations that you will face in the near future. You might not have any direction, which leads to being uninspired or unmotivated. At this point of your life, you might not know what you really want to do. You don t know how to get out of the slump. In the case that you already have a goal, you are not excited to achieve it. When you draw a reversed Ace of Wands, you should consider taking some time off to allow inspiration to come to you. You feel weighed down by your current commitments and responsibilities that you can t come up with new ideas, or muster the passion to push forward in your projects. The Ace of Wands reversal meaning can also indicate delays with your current projects. You want to finish your tasks, but there are things that get in your way. Or you have an idea but don t know how to execute it and make it a reality. When this is the case, you should be patient and wait for the right time.